In part I of this explanation we used mathematics to create beautiful squiggles. While this gives ultimate control over the scribbles (in terms of accuracy and repeatability of the squiggles), sometimes you just want to do something simpler (quick'n dirty) or something more creative (too much work to spell out in math formulas). 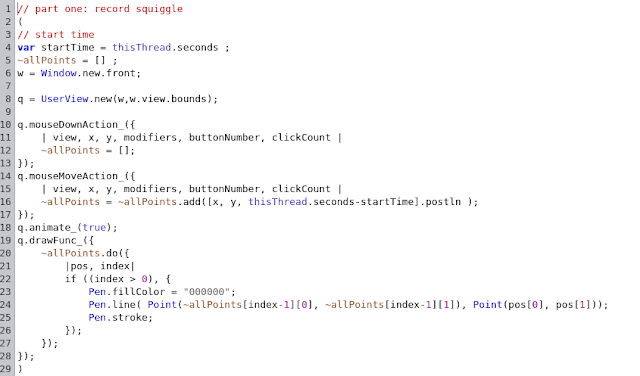 You can simply draw a squiggle with the mouse, record it and then use it to drive a synth. You can also further manipulate the recorded data to produce variations of the recorded gestures. Part I is about recording a squiggle. 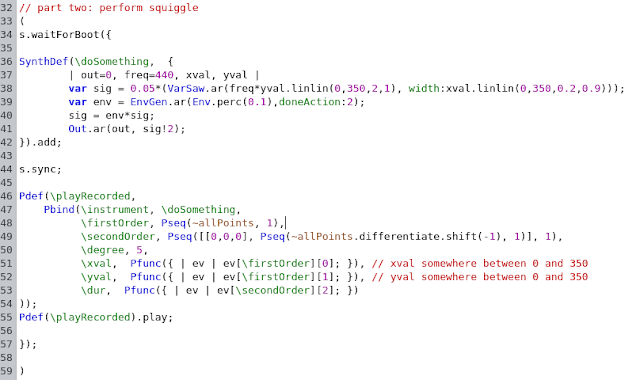 A very simple proof of concept code is given here. 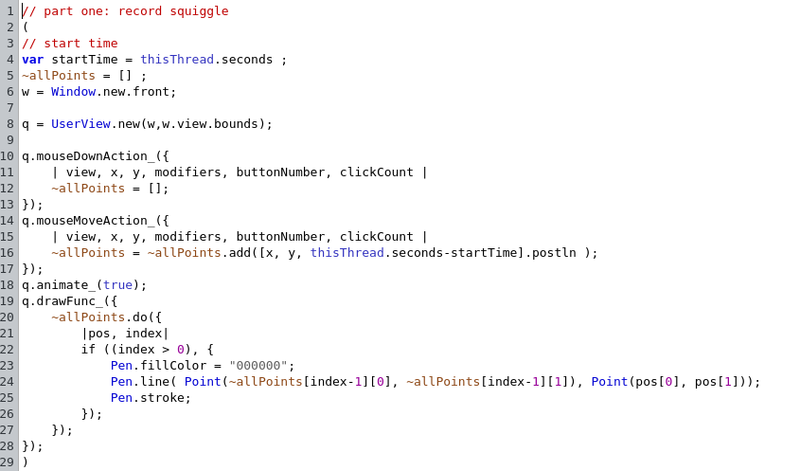 Start the code, then draw a squiggle with left mouse button on the canvas. Both positions and timing information is remembered. 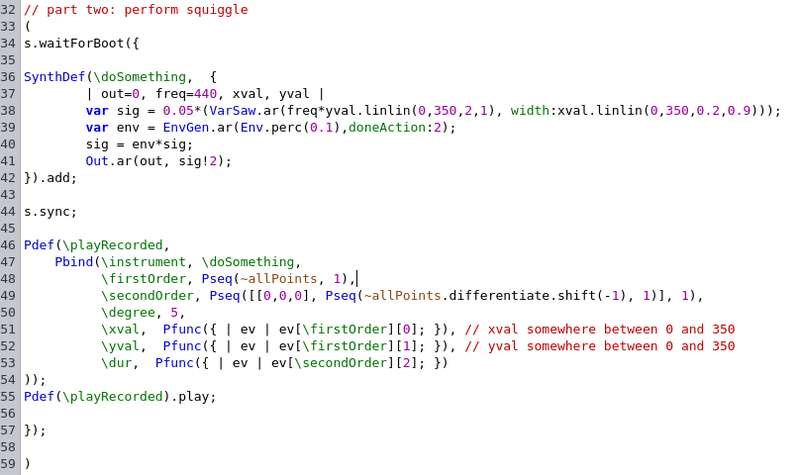 Part II is about performing the recorded squiggle. 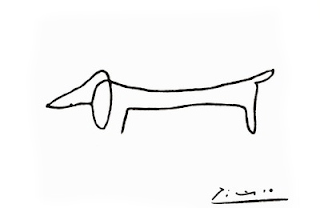 The recorded information is interpreted. Nothing stops you from transforming the recorded data first (e.g. to create mirrored, scaled, skewed, ... or non-linearly transformed versions of the recorded data - this might lead to interesting ways to create new music).